People always talk about the way “Citizen Kane” changed filmmaking. They’ll argue it’s the greatest movie of all time. You’ll hear smart music people talk about how The Beatles changed music. They’ll say they’re the greatest band of all time. Others will discuss “The Sopranos” revolutionizing television. They’ll tell you it’s the greatest TV show ever made. By the time my modern eyes get around to seeing these things, though, they’ve been ripped off and copied and spun around so many times that to me they just seem … fine. “Citizen Kane” plays like an average-to-good movie, The Beatles sound like a good rock band, and “The Sopranos” becomes just another well-made, too-long antihero TV show. “Twin Peaks” was like this. People of a certain age talk about the original 1990s run of the series with a certain reverence and awe reserved for things like “Citizen Kane” and The Beatles and “The Sopranos.” When I got around to watching it earlier this year, I thought it was a pretty good TV show. The quality still comes across, but that thing that made it interesting or wild or revolutionary was harder to spot. In 2017, it’s unclear. That made it all the more meaningful to live through a moment – a “Twin Peaks” moment, somehow – where I actually got to watch something transcend, to feel something rise so far above everything else of its kind that it doesn’t even warrant a comparison. I caught something before it was copied and bastardized so many times that we’ll eventually forget what made the original original. It happened two nights ago. I was watching the 16th hour of “Twin Peaks: The Return.” The 16th hour and episode is described on Showtime with four words: “No knock, no doorbell.” Like much of “Twin Peaks: The Return” and David Lynch’s work, that’s all you get. * There is a moment in this 16th episode that almost feels like something I’ve spent my entire life building toward. *I’ll talk more about this later because I actually haven’t finished the series yet, and I’m saving the last two episodes for one sitting later this week, but the entire run of “Return” feels like something out of a medium that hasn’t even been invented yet. The presentation and direction and writing and storytelling and aesthetic and, you know, just everything, is decades ahead of everything else on TV (and probably in the movies, too, frankly). It’s revolutionary. 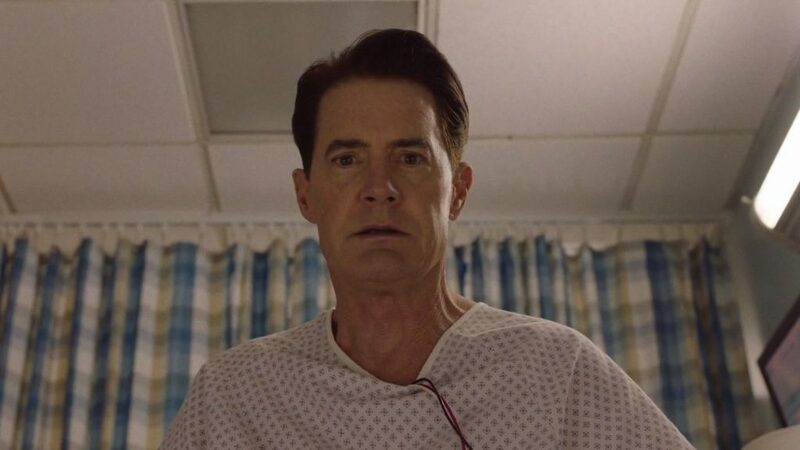 So Dougie Jones/Dale Cooper/Good Dale (played by Kyle MacLachlan) is in a coma. I won’t try to explain this too much because if you try to explain any David Lynch plot for more than 10 seconds, your head explodes like a weird balloon and then you turn into a shiny pearl, but Dougie/Dale/Good Dale went into a coma after hearing Gordon Cole’s name on the TV, remembering he was born out of an electrical socket and deciding to stick a fork into a socket. In “The Return,” David Lynch decided to punish us. Cooper, after 25 years sitting in a red room, is reborn as a baby version of a man, more or less. 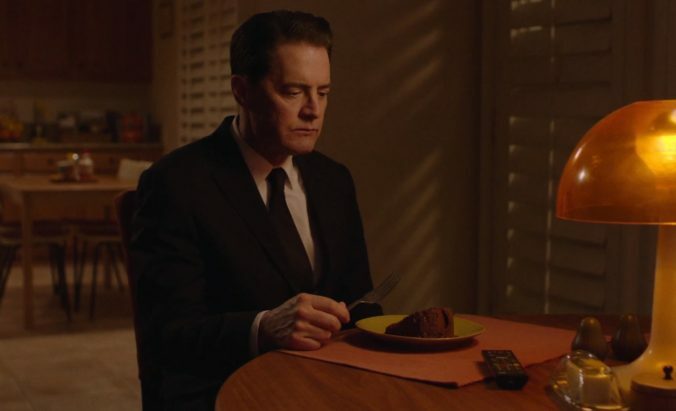 In a brilliant and often hilarious performance, MacLachlan mostly just repeats words back to people, drinks coffee and has to pee. But after 15-and-a-half hours and Dougie/Dale/Good Dale being put into a coma, you really just miss fast-talking Dale Cooper from the Federal Bureau of Investigation. I felt like giving a standing ovation. Cheering. Replaying the moment over and over again until my television stopped working. Dale Cooper was back. It was tremendous because it was delayed, because it was earned, because it was perfectly executed. Lynch knows what people want in reboots. They want to go back and hang out with their old friends. But he has rejected that comfort at every turn. Getting a moment like this – with the main character, mind you, who was more or less silent for 15-and-a-half episodes – became something that made my heart leap out of my chest, where in most shows it would be a given and not even necessary. It made the build-up worth it. It’s all clear so quickly in MacLachlan’s performance, too. When he sits up in the hospital bed, his physical evolution is complete. His face and body and posture and demeanor show that he’s back. When he says “One hundred percent,” you’re already smiling. It was amazing and exciting and brilliant, and I can’t wait to write more about this magnificent show. I’m sure people who have already seen the ending will find this to be a laughable sentiment knowing David Lynch, but … I can’t wait to see what happens next.